The following article was written in 1988 after the authors witnessed a live taping of Showcase in Philadelphia. The show ended in 2001 when Alberts and his wife retired to Florida. Alberts died on Nov. 27, 2009, at the age of 87. See also excerpts from I Am a Sick American, Al's musical opus of political commentary. Artist, educator, businessman, philosopher, humanitarian, show biz personality, forthright American citizen. Maybe you can name a handful of people who qualify for all these titles, but spend a few minutes in the presence of one, and you just may find yourself feeling good again about this crazy, mixed-up, topsy-turvy world. Al Alberts ruled Philadelphia's Saturday morning airwaves since that great pretender to the throne, the incorrigible Pee Wee Herman, actually was the little brat he portrayed. For over 20 years, Uncle Al provided us with a safe harbor in a sea of iniquity. Due to his efforts, and those of his lovely wife and producer, Stella, "the gal who puts it all together," Saturday morning's Al Alberts Showcase (11 AM, Channel 6) was a bastion of quality programming. A typical show opened with a collage of tightly edited, highly charged clips from previous Showcases, accompanied by a snappy, souped-up version of an Alberts standard, flawlessly performed by the hard-driving, three-piece Showcase combo. A "Teenybopper" then introduced the show with "…and, now, here's the star of Showcase–" to which a well-coached audience screamed, "AL ALBERTS!" The "Teenyboppers" were a dozen or so upstart preschoolers, who were one of the show's biggest draws. While honing their craft and vying for each week's three or four featured Teenybopper singing slots, these dedicated performers provided lots of entertainment for the show. After the enthusiastic applause subsided, Al satisfied the stunned audience with a lip-synced number from the Alberts treasury. Each Showcase also featured any number of stirring performances: a 24-year-old Irish baritone segued his way from O' Sole Mio into Elvis Presley's modernization, It's Now or Never; nine nine-year-old, silver-sequined coeds tap-danced their way through a sweat-drenched, high-stepping Lullabye on Broadway; Miss Philadelphia took I'm Changing from the Broadway hit Dreamgirls and, indisputably, made it her own to the wonderment of an attentive audience. Somewhere in the middle of the show, everything else took a backseat to the repartee between Uncle Al and the cuddly Teenyboppers. This delightfully good-natured banter always included a riddle from each Teenybopper. So that no one in the audience missed a trick, Al diligently repeated each puzzling question and its punch line solution and then laughed big heartedly, whether it was funny or not. Some Showcases ended with a resplendent excerpt from Al's crowd pleaser, Try a Little Love. As the last notes continued to echo, the weary, yet contented studio audience shuffled into the cold night, their hearts warmed with the promise of innumerable Showcases to come. Al Albert's Showcase, once the longest running television shows in the Philadelphia market, was an extension of a show biz career that was always identified with professionalism and class. Al Alberts was born in 1922 and grew up in South Philadelphia. He graduated with a degree in finance from Temple University and served in World War II. He and some Army buddies then formed The Four Aces, with Al as lead singer. His career took off as the Aces ran off a string of ten consecutive hits, eight of them going gold. After some 50 years since beginning that career as an 11-year-old piano player on the Horn and Hardarts Children's Hour, and after racking up 100 million record sales, Mr. Alberts was finally getting his due in his home town in the late '80s. 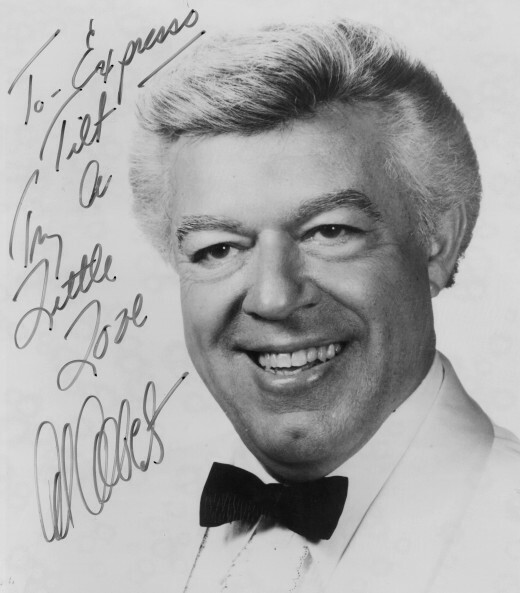 For his lifetime achievement as a musician, songwriter, TV personality, and singer (both as a solo act and as leader of the internationally acclaimed Four Aces), Al Alberts was recognized with a sidewalk star in the Philadelphia Music Foundation's Walk of Fame. And set the echoes ringing. In a classic Alberts ad lib, he remarked to his Showcase audience, "For the first time in my life I'll be glad to get stepped on. All your life you get stepped on, you know, step—step—step—"
But it's difficult to imagine anyone stepping on Al Alberts. A great, swarthy bull of a man with an impressive tidal wave of silver hair crowning his Mt. Rushmoresque features, Uncle Al commanded respect, not through intimidation, but by showing respect. His was a quiet, gentle strength, his greatest strength being that of character. He instilled trust by exuding sincerity, and any cynicism quickly wilted in the face of his distinctly relaxed and disarming demeanor. On this topic, he readily credited the medium's dominant stylist. "I got that from Perry Como," Alberts offered as he slipped into a favorite cardigan. "Everything's just loose and easy. Most of the stuff I do here is strictly what I learned from Perry." It was typical of Alberts to deflect the limelight, illuminating the efforts of others rather than soaking up praise for himself. He was quick to direct attention to Stella, Harry South (his conductor), and to the many achievements of Showcase graduates. If you tuned in Showcase occasionally over the many decades it graced the air waves, perhaps you were lucky enough to catch some of the really big names in the business on their way up–people like Andrea McCardle, Sisters Sledge, and Teddy Pendergrass. Alberts himself continued to sell records worldwide, and he and the other three Aces were always well received at personal appearances. It was clear, however, that getting the little ones, the Teenyboppers, on track for successful careers in the nip-and-tuck world of hot lights and grease paint was Uncle Al's fondest love. And the fondest desire of most of the Teenyboppers was to become a welcome member of Uncle Al's Family, and someday perhaps, something even bigger. There was a certain homogeneous look and air about the Teenyboppers that placed them a cut above other children their age. The little girls kept alive the lost art of the party dress. They invariably finished the look with hair styles that begin with Shirley Temple and end with Donna Reed. For the boys, the white Communion suit was clearly the garb of choice. This stylistic isolationism ran true in musical taste too, which differentiated these young, preschool dilettantes from their contemporaries. Young Jarrod Spector was a Showcase regular since he was two-and-a-half and one of Showcase's brightest stars. He opened for Yakov Smirnov at casinos in Las Vegas and Atlantic City and appeared on Star Search several times. 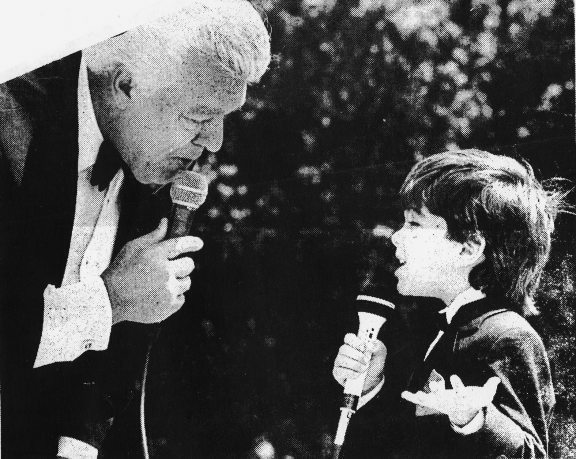 He and Uncle Al were known to perform a duet of My Way. "They grew up with these styles," Alberts explained. "They're polarized, determined. They come here knowing what they want. They want to be on this show. They want to be in show business." As for musical preferences, "One out of ten come to the audition with some far-out rock, but maybe we have them trained that if you wanna be on Showcase, you better do something we can understand." What the Alberts family understood is what those of us who haven't succumbed to the cynical ways of modern times understood: good old-fashioned sing-alongs like Side by Side and Baby Face, songs steeped in tradition, songs that represent basic American values like friendship, love, and family unity. 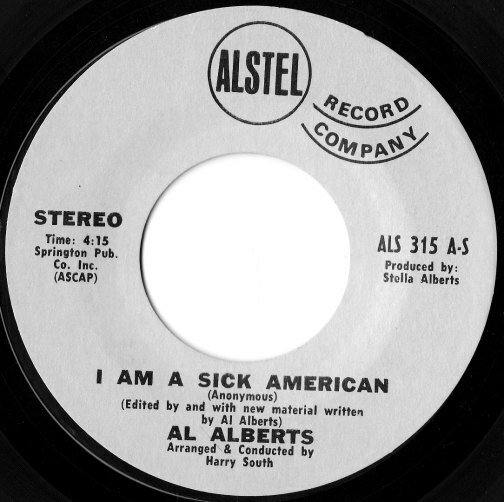 To culminate the Al Alberts experience, you need listen no further than his classic and stirring recording of I Am a Sick American (see the lyrics below). Sick American is based on an anonymous letter Alberts spotted in a daily newspaper. He edited and embellished the letter and delivered the finished work over a background chorus of America the Beautiful, polishing it off with a flip-side solution of Try a Little Love, making this 45 a must for any Alberts fan. When the final votes are tabulated, the history books will show that a simpering stooge like Pee Wee Herman can't hold a candle to the supernova who was the one, the only, and "…the star of the show…AL ALBERTS!" There are those who claim that ours is a sick society; that our country is sick; that we are sick. Well, maybe they're right. I submit that I'm sick…and maybe you are too. I am sick of being told that religion is the opiate of the people but marijuana should be legalized. I am sick of cynical attitudes towards patriotism. I am sick of permissiveness. I am sick of the dirty, the foul-mouthed, and the unwashed. I am sick of dishonest politicians. We have the greatest nation that man has ever brought forth on the face of this earth! So take note, all of you! You will not find me throwing a rock or a bomb. You will not find me under a placard. You will not find me ranting to wild-eyed mobs. You'll find me speaking out in support of those…who have shown the true spirit of this country's determination to…generate brotherhood. For there, you will find the foundation of our precious heritage. There, the cornerstone of that which is even more precious than life itself…FREEDOM! That, my friend, is America…the America I love.